If you have the money and don’t need a ton of volume headroom, the Bose Soundsport wireless headphones are a reliable, decent-sounding choice for commuters and gym goers. In truth, there aren’t too many brands in the headphone space right now that can claim the recognition, market share, and critical reception of Bose. When we were testing our pair of Bose SoundSport Wireless headphones in New York City, it seemed like everywhere we looked someone else had a pair. The price is on the high side and battery life could be better, but from their reliable quality, comfortable fit, and solid audio, the Bose SoundSport are one of those pairs of headphones that just work. 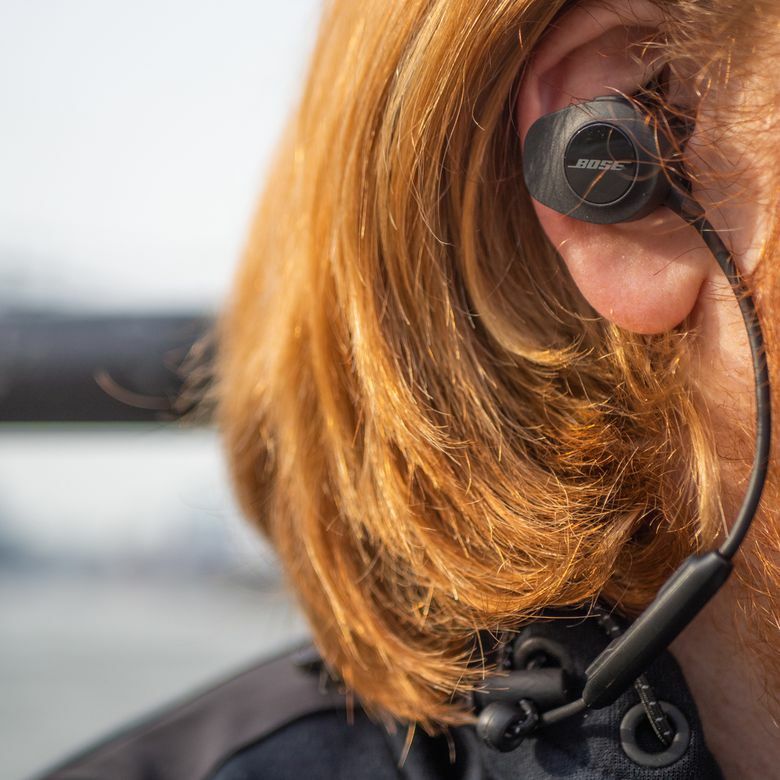 We tested the SoundSport Wireless in NYC, using them out and about the city and on our commute to evaluate build quality, comfort, audio and battery life. At first glance, these headphones are big and bulky, especially when you compare them to the truly wireless Apple Airpods. This leads to some ramifications when it comes to comfort (more in the next section), but on design alone, we’re surprised that the headphones manage to look good, despite being so big. The buds themselves, minus the cable, measure about 1.2 x 1 x 1.2 inches and sport a subtle all-black look. There are also nice teal and lime green options available, as well as one with red accents (though that model is the Pulse version that measures your heartbeat, a feature not on the set we had). The remote is in a nice, easily accessible location, but while its curved, sleek design fits the overall aesthetics of the SoundSports, the buttons were a little awkward to press. Finally, the cable itself, which is about 22 inches long, is a thick, substantial-feeling round wire that’s meant to wrap around or under your neck. We prefer flat cables to avoid tangling, fortunately, this didn’t prove to be a problem. The case is also a plush, flat circular pouch with a metal carabiner on the outside. It wasn’t as substantial as the hardshell cases found with even some cheaper Bluetooth headsets, but we liked the secondary benefit of being able to toss it into a backpack without taking up a bunch of extra space. Like many of the other earbuds in this class, these are advertised and optimized for exercise. Those StayHear+ Sport eartips have a soft, durable rubber that didn’t seem to wear out at all, even after a week’s worth of heavy use. The cable feels substantial, and the build quality on the buds themselves also feels pretty great. There is some water resistance built into these, but Bose doesn’t say what the IP rating is, just merely that they are sweat- and water-resistant. The acoustic ports have been designed and placed to resist sweat and some minor precipitation, and there’s a hydrophobic cloth as part of the construction that also serves as some protection. Our guess is that these wouldn’t fare well submerged fully in water, but they were perfectly fine in the rain and during even our most sweaty workout. The StayHear+ Sport earpieces that Bose has chosen to include on their SoundSport line of headphones are a really unique shape. Rather than a perfectly round silicon or foam tip, they’re somewhat oval-shaped, almost as if someone crushed or crimped a normal set of tips. You’ll have size options including a ¾-inch tip, a ½-inch and one somewhere in between, but be sure to note that the curved rubber wing that holds it into your ear is attached to these tips. Those wings range from ½ inch to an inch. This makes it easy to swap out tips and wings, but it does run you the risk of being stuck with an ear tip that doesn’t fit and a wing that does, or vice versa. We were easily able to wear these for long periods of time with relatively little fatigue. At the end of the day, we like the oblong shape of the earpieces. It doesn’t create quite the seal you’ll get from a circular tip, and that does have some effects on the listening experience, but it also means that you don’t have that uncomfortable pressurized feeling you get with some exercise earbuds. We were easily able to wear these for long periods of time with relatively little fatigue. Their larger size (probably accounting for more substantial drivers and components), leads to a weight of about 0.8 ounces, and though they appear pretty heavy at first glance, we didn’t notice much of an issue during usage. You pair these headphones simply by long-pressing the power button on the right bud until it enters pairing mode. What’s nice about these headphones is that there’s a clear voice that speaks in plain English when you’re swapping between modes. It will tell you things like the battery percentage, let you know what specific device you’re paired to, and if you’re entering pairing mode, it will tell you specifically that it’s ready to pair another device. The voice is a bit robotic, but compared with other earbuds, the level of specificity is very welcome. One of the contentious things about Bose, particularly from an audiophile standpoint, is that you’ll never receive a full list of detailed specs from the brand. It makes it really hard to get their products’ sound quality down on paper because it isn’t clear what their impedance levels are, what the frequency response is, and other more detailed specs. We can say, however, that the sound character on these headphones from a subjective standpoint is great. There seems to be full coverage and great polish across the entire spectrum. You’ll get plenty of oomph on the low end, a good amount of detail throughout the middle (a section of the spectrum that is often muddy with other headphones), and nice sparkling highs. The only issue we found on the sound front is a noted lack of volume. This could be due to the aforementioned earbud shape, as it doesn’t create a firm seal and doesn’t block out as much noise. But, it would have been helpful to the sound quality of these headphones if we could push the volume a bit more. The sound character on these headphones from a subjective standpoint is great. There seems to be full coverage and great polish across the entire spectrum. In terms of sound transmission, when the SoundSports are connected properly, they work perfectly. They support Bluetooth 4.1 which isn’t as reliable as 5.0, so you’ll definitely get some slight latency if you’re playing games, but for common use (podcasts, music, some light video), the connection was stable. The connection seemed to have the most trouble when around other wireless and Bluetooth devices, but nothing that ever caused us to lose connection fully. That said, we found some anomalies with phone calls using these as a headset. When it worked, the calls were clear and crisp, and the microphone was one of the best we’d used. But among those we tested, these headphones were the most prone to strange Bluetooth distortion and skipping. The rechargeable battery in these headphones was passable, but not spectacular. Bose advertises that you’ll get 6 hours of listening per full charge, and we found that to be true for the most part. Because we sometimes had to push the volume higher than other headphones, we’d occasionally get less music time. According to Bose, it also takes two hours to charge up the headphones with the included micro-USB charging cable, but we found that it took a good deal less time than that (closer to 90 minutes). Everything is a trade-off with battery life, and when taken at face value, these headphones do a pretty good job. But, because they’re so big, we kind of expected more life out of them and were slightly disappointed at the outcome. One key differentiating factor for Bluetooth headphones is the use of a dedicated app to customize your experience. The Bose Connect app doesn’t offer the same sorts of EQ controls or sonic molding that some other apps from companies like Jaybird do, but there are some interesting features here. First of all, you can easily connect and disconnect devices through the app, which is a more pleasant experience than refreshing your device’s Bluetooth list. Another cool feature in the Bose Connect app is the ability to stream music between Bose devices seamlessly. That’s tremendously useful if you and your friend both have a Bose product since one unfortunate casualty of the wireless age is the fact that you can’t just bust out a splitter to share media. One last thing to note: Bose touts a “Find My Earbuds” feature, but it only seems to work with the truly wireless SoundSport Free headphones, not the SoundSport propers. These headphones typically sit right at $149.95. Bose rarely has sales, though, during Black Friday and other big deal weekends, we saw these available for $99.99. That price difference is a big point — $150 puts you firmly in the premium price range while $100 undercuts some of the competition’s price. For sound and build quality alone, these are probably worth the full retail price if you can afford it. At the end of the day, the SoundSports aren’t cheap, but the price seems fair for what you get. Some of the bells and whistles like the accompanying app, the Bose headphone pairing tools and the voice cues that are really specific make it a seamless product experience for the average user. But the lack of volume and some of the minor connection issues we ran into gave us a bit of pause. Again, the price is befitting of the brand, and the fit and finish is nice with a good packaging experience. So if Bose is your thing, you won’t be disappointed. There are a few sets of headphones that play in this space, though none of them have everything that the SoundSports have. The Jaybird X4s and Jaybird Tarah Pros have some flashier features, but we found the fit and the sound quality to be better on the Bose. The Shure SE-215s are a more classic-looking set of in-ear monitors that seem to have a better package on the sound quality front, but not the same look and build quality of the Bose. And if you step up to almost double the price, you can get a pair of Bang & Olufsen Beoplay earbuds that will give you basically everything you’d want for sound quality but are very expensive. At the end of the day, the SoundSports aren’t cheap, but the price seems fair for what you get. Want to look at other options? Check out our lists of the best wireless earbuds and best Bose headphones on the market now. You can’t go (too) wrong. You can save some money and get passable sound quality and a good build from more affordable options. What you get with these headphones is an easy-to-use and great feeling set of earbuds, with water resistance and a subjectively great sound for an objectively premium price. Product Dimensions 22 x 1 x 1.2 in.